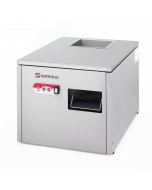 The Frucosol SH-3000 is perfect for restaurants and hotels that are serving up to 150 covers per seating and are looking to save both time and money. The SH-3000 can dry and enhance the shine of 3000 pieces of cutlery per hour. The SH-3000 has a fan motor at the end of the circuit, making it much quieter that rival machines. 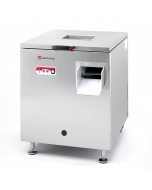 The fan motor provides the SH-3000 with hot air, so the wet cutlery will be completely dry and this also removes the humidity from the SH-3000 as well. The UV lamp inside the SH-3000 helps to sterilise the cutlery and the granulate during the process. The SH-3000 is manufactured in polished stainless steel and is easy to clean, and can also be mounted on a bar without using the trolley.